Megan Klim participated in the Under the Influence show in Fall 2016 at Village West. A physical presence is apparent in Klim's work with the worked, punctured surfaces of her drawings and the linear markmaking -- either with thread or by an unsteady ink rendering. 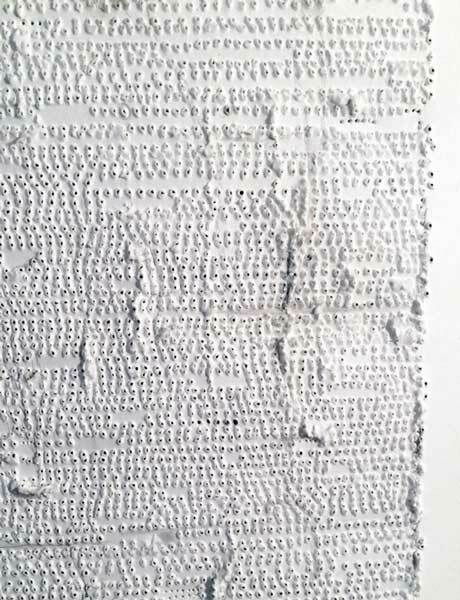 Through her use of pattern and repetition, she reflects upon human individuality while also offering a tactile visual experience with her materials. It is her hope that through the tangible an ethereal space is experienced and felt instead of just seen. For more information, please visit www.meganklim.com.